The three Republican candidates who’re running for governor shared a stage for 90 minutes on Saturday, aiming their fire at Democratic Governor Chet Culver and, sometimes, at one other. Both Roberts and Vander Plaats suggested the state needs a new governor, with emphasis on the word “new” since their Republican competitor was Iowa’s governor for 16 years. Branstad, meanwhile, interrupted Vander Plaats twice during the debate. The first time it happened was when Vander Plaats suggested Branstad hadn’t always been a “team player” because Branstad had endorsed a Democrat running for Nebraska’s U.S. senate seat in 2000. Later, as Vander Plaats was making a misstatement about something Congressman Steve King did a few years ago, Branstad jumped in to correct Vander Plaats. “You’re wrong in what you’re saying,” Branstad said. Vander Plaats stressed that it was his turn to talk: “I think I’m right with my time,” Vander Plaats said. After the debate was over, Branstad kept pressing the issue, telling Vander Plaats loudly to “look it up” to see that he was wrong. Saturday’s debate was sponsored by the Iowa Broadcast News Association and aired twice on Iowa Public Television on Saturday. 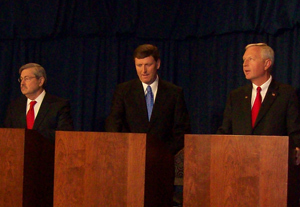 A third and final debate featuring the three candidates is scheduled for May 20.